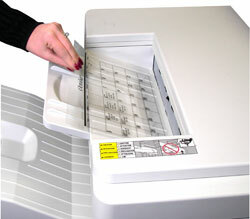 Reusable, write-on film for overhead transparencies. Make any presentation more interactive by using the transparency film to visually demonstrate what you are talking about. The film can be reused, making it both an economical and beneficial item to keep on hand when meeting with customers. Reusable, write-on film for overhead transparencies. Use overhead markers or grease pencils to make bright, colorful presentations. Economical, easy-to-use material cleans up easily, so you can use over and over. 8 1/2 x 11 sheets. Not for use in copy machines. 100/BX.